On 26 January 2015, one day before Turkey’s Universal Periodic Review by the United Nations, the World Council of Arameans (WCA) is organizing a side event in Geneva on “Turkey’s Native Aramean People: The Case of an Unrecognized Minority”. Aramean indigenous people and minority in Turkey (20 000 people) is still not recognized by this state and consequently their minority rights denied since 1923, year of the foundation of the Turkish state after the Lausanne Convention, treaty that conferred minority statute and rights to non-Muslims in Turkey. In practice, Aramean teachers have been imprisoned for teaching Aramaic and state officials attempted to permanently close down ancient Christian monasteries such as Saffron in Mardin (1978) and Mor Gabriel in Midyat (1997) for educating children Aramaic. A lot of Aramean villages were evacuated in 1990’s and the killings of more than 60 persons between 1976-2004 remain unsolved. The land of Arameans was illegally occupied and expropriated. The recurrent Turkification attempts, the oppression and the systematic discrimination led to a mass exodus of Arameans from their ancestral land to Western Europe. Therefore, the recognition and the protection of Aramean Christians and of their cultural heritage is vital. ECLJ participates in this event, Mr. Grégor Puppinck, Director of European Centre for Law and Justice giving a speech on the legal basis of the recognition of the Aramean Christians and of their rights under international and European law. A number of UN Missions, NGOs and media are invited to attend this event where Ms. Susanne Güsten, Foreign correspondent in Turkey & Mercator-IPC Fellow at Istanbul Policy Center and Justice, Ms. Nurcan Kaya, Turkey coordinator of Minority Rights Group are also invited as guest speakers. They will highlight why the recognition of the Aramean people is of critical importance for their survival in Turkey (and the broader Middle East) and will offer recommendations to the UN regarding the recognition of the Aramean people. The Arameans or Syriacs (in Greek, since the 5th century) are an ancient Semitic people, speaking Aramaic (the mother tongue of Jesus Christ and his apostles), who are natives of Southeast Turkey, Syria, Iraq and Lebanon, where they are a minority group. In the first century, they converted to Christianity, as the numerous monasteries and churches testify. They are Orthodox, Catholic or Protestant communities, but the Chaldeans, Nestorians (since 1976 called Assyrians), Maronites and Melkites are also heirs of the ancient Aramaic heritage. In 1915, according to a Memorandum of the Syriac Orthodox Church delivered to the Peace Conference in London, in 1920, more than 90 000 of its faithful were murdered in Turkey, fact that is denied by this country. The Lausanne Treaty of 24 July 1923, ratified by Turkey in August 1923, granted to minorities (“racial, linguistic and religious”, according to the international law) not only equal rights with the majority, but also internationally guaranteed rights that did not apply to the majority (e.g. building their own schools and using their own language). This “positive discrimination” was justified by the conviction that minorities, having lived in disadvantageous, or even hostile, environment, could not keep their cultural identity without any supportive measures. However, the Turkish delegation in Lausanne recognized only “non-Muslims” as constituting a minority and had this position accepted at the Conference. Therefore, only religious minorities were recognized as minorities in Turkey. Moreover, in practice, Turkey interpreted this notion arbitrarily, limiting even more the scope of the Treaty, considering only the well-known traditional “millets”- Armenians, Greeks and Jews- as minorities, even though there was no such mention in the Treaty. Smaller Christian groups, such as Syriacs, Caldeans, Assyrians and Nestorians, have been left out of the Treaty’s protection solely by the conduct of the Turkish state. To date, Israel is the only state in the region that recognized the Aramean community within its borders as a national (ethnic) minority, allowing most of the Syriac Christians in Israel (around 10,000) to be registered as "Aramean" instead of "Arab", on 16 September 2014. This decision on part of the Israeli Interior Ministry highlights the growing awareness regarding the distinctness of the Aramean identity as well as their plight due to the historical Arabization of the region. The non-recognition of the Arameans as minority has consequences, as their basic human rights and dignity are not recognized and therefore they do not benefit of any protection. Some of the rights denied to Arameans or violated by the Turkish state are the following: the right to have a legal status as a religious community, the right to property, the right to establish, manage and control any charitable, religious and social institutions, schools or establishments for instruction and education, the right to carry out religious services and religious education in the Aramaic mother tongue and the right to preserve from extinction the Aramaic language. Yet, at international level, Turkey refuses to implement the Lausanne Treaty, to ratify the Declaration on the rights and persons belonging to national or ethnic, religious and linguistic minorities adopted by the GA resolution 47/135 of 18 December 1992, to apply the Declaration on the rights of indigenous peoples, 2007 and to sign the UNESCO Convention on the Protection and Promotion of the Diversity of cultural expression, 2005. “19.7. recognise, promote and protect the Syriac people as a minority, which is indigenous to south-east Turkey, in conformity with the Lausanne Treaty and related international conventions which guarantee their fundamental human rights and dignity; this shall include, but shall not be limited to, officially developing their education and carrying out religious services in their native language, Aramaic”. Nevertheless, Turkey did not report back on this resolution by February 2011, dead line fixed by the Parliamentary Assembly. Regarding the right to property and the Christian and cultural heritage of Arameans, on 16 October 2014, the European Court of Human Rights communicated to the Turkish Government the case of Fondation du monastère syriaque de Saint-Gabriel à Midyat v. Turkey (application no. 61412/11), introduced on 18 August 2011. 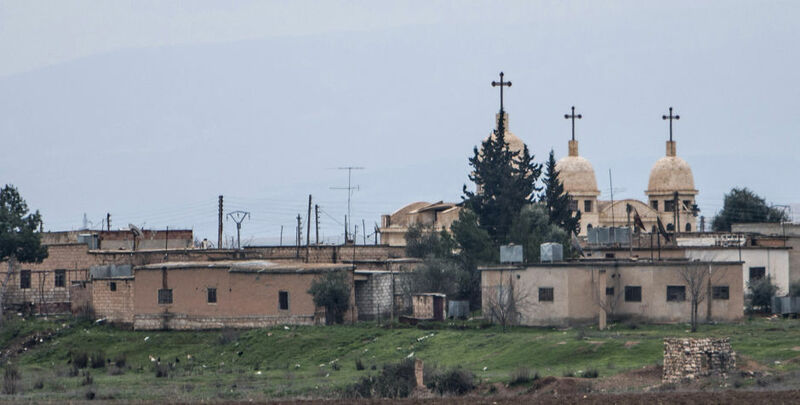 The case concerns the de facto expropriation of two parcels of land surrounding the Syriac Mor Gabriel Monastery, founded in 397 A.D., as they were illegally declared forests. The value of this monastery is not only material, but also spiritual, as it trains half of the Syriac clergy and enables the survival of the Aramaic language. Therefore, the Turkish Government has to submit written observations, rendering account of the respect of its engagements taken under the European Convention on Human Rights, notably of Article 1 of Protocol no. 1 to the Convention (the protection of property). ECLJ hopes that this side event will be a new occasion to raise awareness of the dramatic situation of Arameans in the Middle East and to encourage international and European institutions to take concrete steps to preserve the existence and the heritage of Christian Arameans in this region.